squirrels stealing food from your favorite feathered friends? there are several steps you can take to gain the upper hand. Squirrels are fairly predictable, and they can easily be deterred. The key is to understand their patterns. You can turn your backyard into an unfriendly zone for those pesky rodents with just a few simple actions. The best way to prevent squirrels from pilfering bird food is to stop making it so easy for them. These bushy-tailed bullies are amazing acrobats, and they don’t mind jumping, flipping and spinning for their food. The trick is to complicate things so their efforts are wasted and they grow tired of trying. The right squirrel proof feeder will give you the results you want. 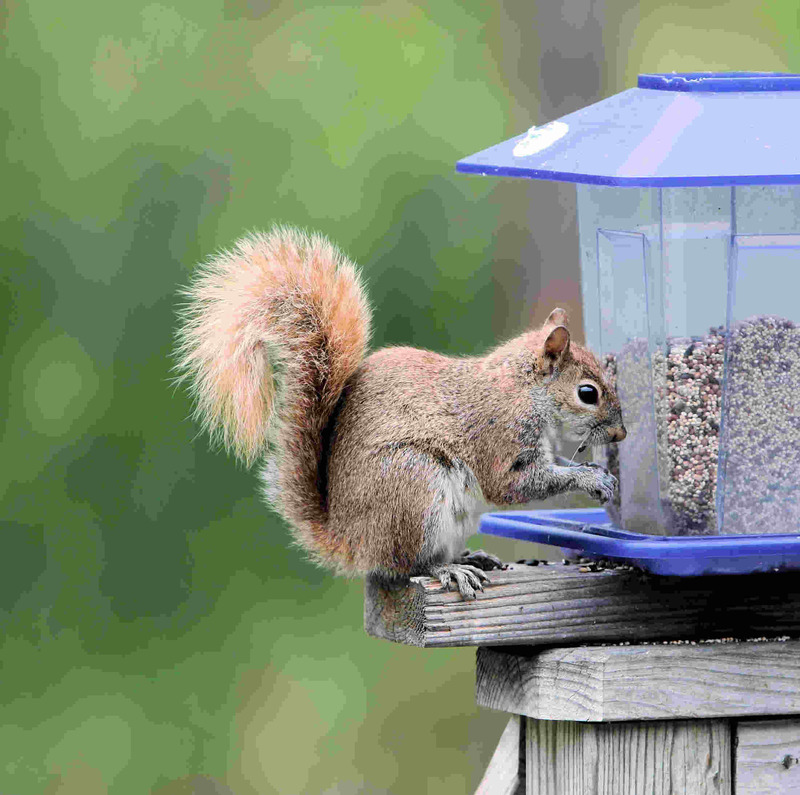 One of the most commonly used squirrel proof feeders is the baffled unit. This feeder comes with a baffle or dome placed over the feeding receptacle. A squirrel will climb on top the dome, but it will not be able to maneuver itself to snag the food. An alternative to the baffle is a caged feeder. Surround your bird feeder with a cage or mesh wiring that has large enough holes for birds to fit through. Squirrels won’t be able to squeeze through the tight spaces. Many people use bird feeders constructed with perches that are weight activated. Lightweight birds can rest atop the hinged perch, but a heavy squirrel will cause the perch to bend. The squirrel will drop to the ground and have to search for dinner elsewhere. You can also hang your feeder from a thin wire attached to a tree branch. However, this option may not work if the squirrel is a fearless jumper. If your bird feeder is near any type of launching base, hungry squirrels will attempt to attack it. Placing your feeder in a wide open space will prevent squirrels from skydiving onto it. Typically, leaving a space of at least 10 feet around the feeder will suffice. Look for anything a squirrel can jump from including wires, gutters, light posts, shrubs or branches. Make sure there is still some type of shelter close by so birds feel safe. If you use a bird feeder that is mounted on a post, you should place the feeding receptacle at least five feet from the ground. Hanging a baffle underneath the feeder provides extra protection. You can also grease the post with shortening or petroleum jelly so squirrels cannot get a firm enough grip to climb to the feeder. Choose a substance that will not harm the squirrels or other animals. Squirrels are naturally gifted at solving problems, which means many of your prevention efforts may be futile. Many homeowners complain that their squirrel invasions seem to worsen with each effort. If your unwelcome visitors beat you at your own game, try turning your backyard from party central into a boring wasteland. One way to do this is to choose bird feed that squirrels often pass by such as suet or safflower seeds. You can also put hot pepper in the bird seed, which will not affect the birds but will repel squirrels. To thoroughly repulse the squirrels in your yard, fill mesh bags with mothballs and place them near your feeders. You can spray the surrounding ground with squirrel repellant as well. The bird food will drop from the feeders, and the squirrels will eat the seeds only to discover they aren’t so tasty. You can also place a tray underneath your bird feeder to catch the seeds and prevent the squirrels from sampling any at all. Squirrels will lose interest if there is no food to enjoy in your yard. Keep your garbage cans tightly sealed, and avoid leaving grill drippings, pet food, fruit remnants, nuts or other types of food around your yard. Frequently clean up any seeds particularly if you have artificial grass. Squirrels can tear up the fibers while digging up fallen seeds. By watching the actions of your little pests, you can easily determine how to lose their interest. If you are losing the backyard battle with these uninvited guests, take some time to learn about their routines. By observing how squirrels feed, you can discourage them from making a home in your backyard. For more tips on how to deter squirrels from overtaking your yard, contact Install It Direct. Join our mailing list for insider information on all your backyard needs.